Last month I worked with Jon Winet and David Levi Strauss at the Republican National Convention in Cleveland. • Half of the Democratic delegates were people of color. For Republicans, it was only 6%. 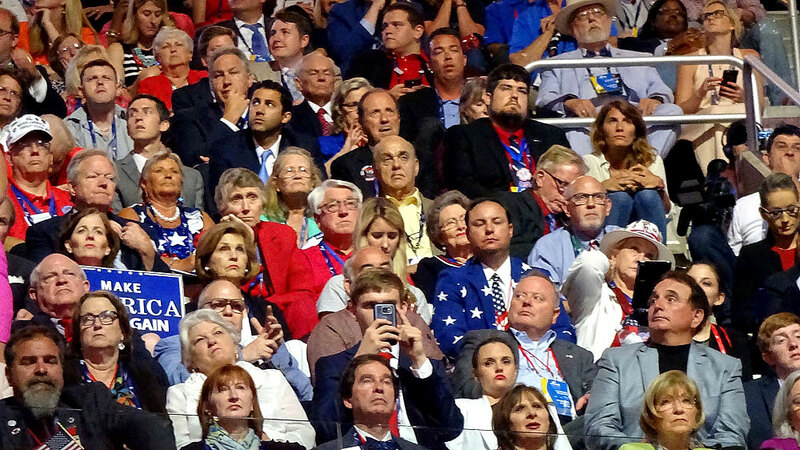 There was an alarming lack of diversity among the delegates and guests (see photos above and below.). There are over 100 people pictured in the two photos combined and I am only able to identify one person of color. During the past year I have been working in a high poverty, rural and highly segregated African-American public school district in Northern Mississippi. I have become acutely aware of the disparity in resources and opportunities for our students compared with affluent white suburban schools. The lack of representation in a major political party of the demographics like my school district does not bode well for that party being able to address serious issues of racial divide and economic inequality. 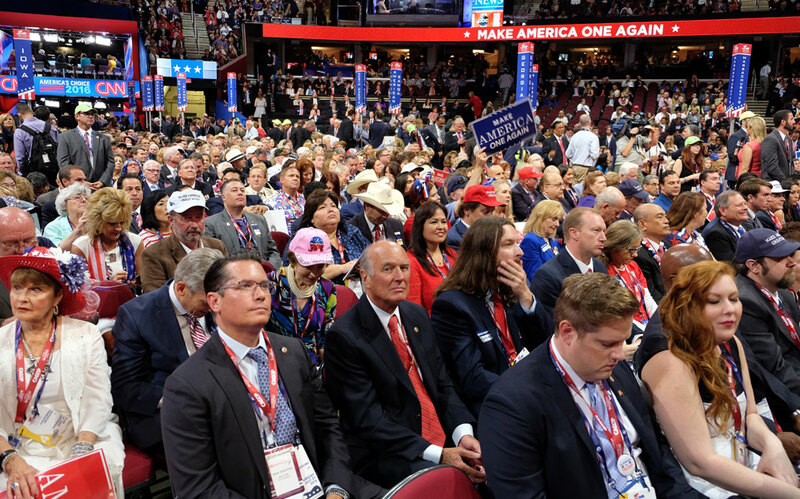 • In my 15+ interviews with delegates I always asked, “Are you a Trump supporter, and if so, why?” Their answers broke down into two equally divided categories. First, there are the ardent Trump supporters who had identified with him from the early going. Their reason was primarily that the system is broken (rigged) and needed to be “blown up”. Trump was the only one prepared to accomplish this. They would go on to note one or more issues (e.g. trade, business experience, etc) that they supported or that made him qualified. They dismissed Trump’s temperament issues as insignificant in comparison to the larger goal of disrupting the system. Everyone in this category is passionate and committed. The second group are the party loyalists who will support the candidate of the party. Their consistent answer to “do you support Trump” was, “I am now.” All of these had other preferred candidates (Ted Cruz and Marco Rubio primarily) and were not willing to not vote, vote for a third party or cross party lines. They are not passionate but resigned. One expressed a strong moral reason to vote – “American soldiers died for our right to vote”. Embedded in these categories as well is a strong element of distrust and disgust bordering on hate for Hillary Clinton. The convention speakers rarely missed an opportunity to attack Clinton often appealing to the base emotions of hate and fear. “Lock her up” is their slogan. I found all of the delegates and guests I interviewed to be cordial and generous and that the people I talked with seemed reasonable with considered positions. There were no wild eyed crazies often seen at Trump rallies. These were the folks chosen to represent their districts. They were either fully supporting the candidate or acting out of party loyalty. While I do not agree with their assessment of the Republican candidate I do respect their right to their positions. • Finally, I want to comment on the Republican Presidential candidate. I recently completed a biography of Bobby Kennedy by Larry Tye, Bobby Kennedy: The Making of a Liberal Icon). During Kennedy’s 1968 campaign one of the reporters commented; “I have never before, nor since, seen a politician with that core of feeling for other people, especially people who needed his help.” I will simply let that description stand in contrast to the 2016 Republican candidate. August 6, 2016 11:20 a.m. Rob emailed the folliowing comment, posted her with his permission. Seems to me at the core of all this is the issue of identity groups in America harboring deep distrust for each other. Part of this is the fact that the dominant (white affluent) group never sees itself as a group or feels that it is involved at all in identity politics. I’ve had lots of discussions with my friend Larry, a black professor at MIT who is very convincing that it’s up to white people to end racism by creating opportunity for minority groups (he feels equally that it’s up to men to create equality for women). One of his points which was hardest for me to grasp is that the values that white people cherish are just that – white people’s values. We tend not to see them as such because we’re the dominant group and we think our values are “universal” values. His example for me was the desire to spend time in nature; I’ve always thought this was a purely “human” need and value (Thoreau etc) – to which Larry responded “how many black people do you see in the woods or at the beach.” Ouch. So the tough nut to crack is getting groups to recognize each other’s values as valid and their own as not being “universal.” This is also why you see minority groups clinging so tightly to their own values (religious, ethnic, racial, economic bracket) – the dominant values of the highly educated white capitalist is out of their reach and being imposed on them.